Now, before we launch into the difference of the Northern and Southern organizations, I want to note that I haven’t seen any definitive sources to prove that the Southern relief groups were at Gettysburg. If you know something specific and can share your source, please inform me in a comment! So, though this article isn’t “Gettysburg focused” necessarily, it is the other side’s companion piece to the previous articles this month. Supplying vs. States Right was just one of the challenges the Confederacy encountered because of their government ideas. The Southern states seceded because they didn’t want the Federal government bossing them. Strict Constitutionalists, the Southerners believed strongly in the Tenth Amendment to the Constitution which states “Powers delegated to the United States by the Constitution, nor prohibited by it to the States, are reserved to the States respectively, or to the people.” They also believed the states had voluntarily joined the union and could leave if they chose. Now, the idea of state’s rights prompted secession and the formation of the Confederate government. (Confederacy is actually a governing form where states get to tell the central government what to do – in theory, anyway.) However, that very principle which formed the Confederate States of America became its Achilles Heel. Jeff Davis and his government wanted the states to work together and issued orders. The states snubbed their noses at him and waved their banner of state’s rights. Each state in the Confederacy was in charge of relief efforts for its own soldiers. Thus, Virginian civilians were supposed to provide for Virginia soldiers and not worry about supplies for the guys from Alabama because the Alabama folks would take care of their own. Southern photos are scarce and this picture is actually of a Union relief agency in the field, but it gives an idea of the field work done by GRHA. 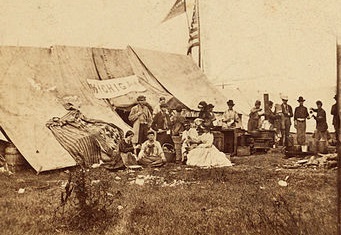 One of the best organized Confederate state relief agencies was Georgia Relief and Hospital Association (GRHA). Georgia was one state that her act together and did a fabulous job setting and meeting goals. The organization was started in December 1861 with state appropriated funds, and they were audited every year to make sure the money was used appropriately. Women on the home front were instructed by newspaper articles what items to collect or prepare and their local ladies’ groups got busy. The finished supplies were sent to the association. 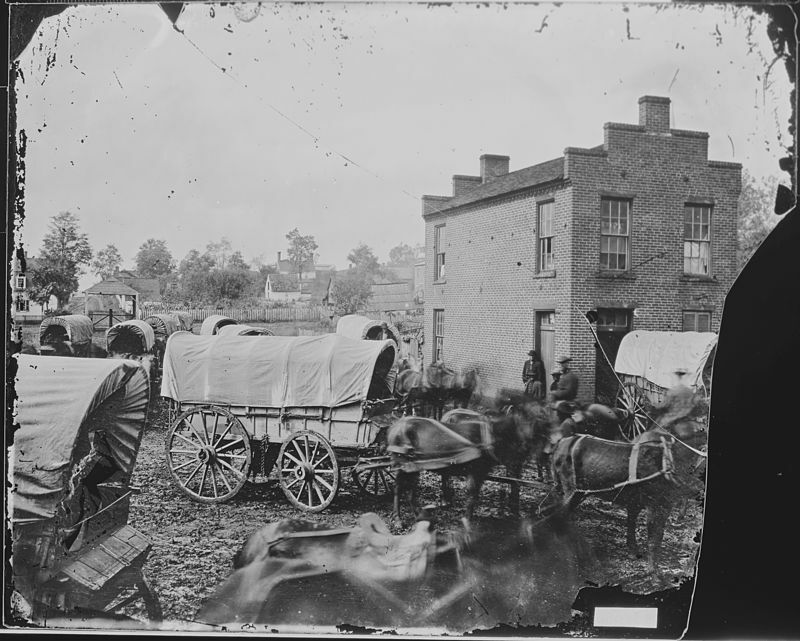 Then, qualified agents took charge of the supplies, transported them to army locations or the warehouses in Richmond. (Richmond was the capital of the Confederacy.) Georgia regiments and medical units could write to the warehouses and order the supplies they needed. Georgia’s organization was very successful and is a model of what each Southern state should’ve been trying to achieve, but even their system of supply broke down as the transportation became limited and the state was invaded. It should also be noted that not all state’s groups were as ambitious or as successful as Georgia…but they tried. The Confederacy lacked the invincible power of a centralized supply organization, but with their views of government they could not have adopted that system. The state controlled relief system was not as effective, but it was state and local controlled. Considering the supply difficulties, transportation trials, and general break-down of society in the last years of the war, it is still amazing what these state organizations were able to accomplish. Perhaps they weren’t as powerful, but their desire to provide supplies for “the boys in the field” was the same as the Northern organizations. And their dedication and selflessness cannot be denied. Rather, we must commend them for striving so hard…for so long. P.S. Which supply system (Northern or Southern) do you had the best underlying principle? I really enjoyed this article, thanks. You’re very welcome! Thanks for commenting.